An inspection and hydrostatic test should be made at periodic intervals (at least once a year) to determine if a hose is suitable for continued service. 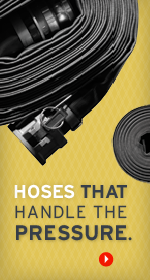 A visual inspection of hose as described previously should be made for loose cover, kinks, bulges, soft spots which might indicate broken or displaced reinforcement. The couplings (or fittings) should be closely examined and, if there is any sign of movement of the hose from the couplings, the hose must be removed from service. The periodic inspection should include a hydrostatic test for one minute at 150% of the recommended working pressure of the hose. During the hydrostatic test, the hose should be straight, not coiled or in a kinked position. Water is the usual test medium and following the test the hose may be flushed with alcohol (if the hose is resistant to alcohol) to remove the traces of water. Air or other compressed gases should not be used for pressure testing. All air should be removed from the hose prior to testing by bleeding it through an outlet valve attached to one end of the hose. Hose to be pressure tested should be restrained by placing steel rods or strap close to each end and at approximate 10 foot intervals along its length to keep the hose from “whipping” if failure occurs. The steel rods or straps are to be firmly anchored to the test structure in such a manner that they do not restrict the movement of the hose under pressure. The outlet ends of the hose should be placed so that an ejected fitting will be restrained by a wall, sand bags, etc. Provision must be made to protect personnel from the forces of the pressure media if a failure occurs. Testing personnel must never stand over, in front of, or in back of the ends of a hose being pressure tested. Inspect the hose tube for hardness, color change, cracks, blisters, erosion, etc.